These images were originally part of a collaborative installation work, titled 'Conference call', made with renowned African-American conceptual artist Adrian Piper, for 'The boundary rider: 9th Biennale of Sydney', Art Gallery of NSW, 1992. In the Biennale, the images were displayed in a darkened room furnished with office chairs where people were encouraged to sit and answer incessantly ringing telephones. On the 'phones, listeners heard someone talking in an unidentified Aboriginal language followed by a translation in English. Croft took these photos at key sites around Redfern and presents images of Aboriginal people, with a diversity of experiences and backgrounds, standing proudly within their urban environment. Contrary to the usual media depictions of Redfern's Aboriginal community, Croft presents a positive image from an insider's viewpoint. Included in these images are significant individuals who have worked tirelessly for their people, some of whom have since passed away and are thus memorialised in the images. 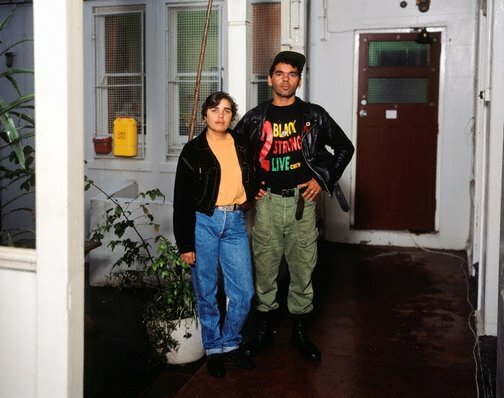 Half light: Portraits from black Australia , 'Brenda L Croft', pg. 56-63, Sydney, 2008, 60 (colour illus. ).